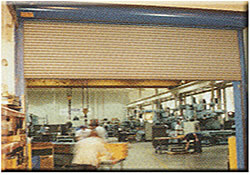 Mahon Door Underwriters rolling steel doors can be installed on openings requiring fire labeled closures. In the event of fire these doors will close automatically upon the melting of the fusible link, and/or release by smoke detection devices, and prevent the passage of flame and smoke. Under normal usage they operate with the same ease as service doors. Thru wall fusible links are available as an optional item. Mahon Underwriters doors may be operated manually, by hand chain, by hand cranks or by motor operation. Labels are available on doors up to 120 sq. ft. with no greater dimension than 12’- 0” in width or height. Oversize certificates can be furnished for doors up to 576 sq. ft. with no greater dimension than 24’- 0” in width or height. Underwriters Oversized Certificate - an underwriters certificate of factory inspection is furnished on all Mahon doors exceeding 120 sq. ft. in door area. This certificate certifies that the door was made in compliance with Underwriters Laboratories, Inc. requirements. U.L. Listed Expansion Sheilds - where required, Mahon can now furnish listed expansion shields for use on concrete jambs, also complies with NFPA 80 standards for fire doors and windows. U.L. Listed Motors - when specified, Mahon can supply listed operators along with many optional electrical control devices. Ease of door operation makes motor operation a desireable option. Slat Types - as indicated, the Mahon slat #3 is standard with fire doors; slat #4 (insulated) and slat #5 (flat slat) are optional items, and will be supplied if specified. All slats furnished in gauges as specified by U.L., heavier gauges when specified will be furnished as an optional item. Specifications hilighted in red above available for this door. For more details on Fire doors call today 1-630-350-7667 or fill out our contact form.